They’ve been dubbed ‘The Lucky 13s’ and this year as they’ve turned heads and dazzled whenever they’ve stepped out onto the pitch. 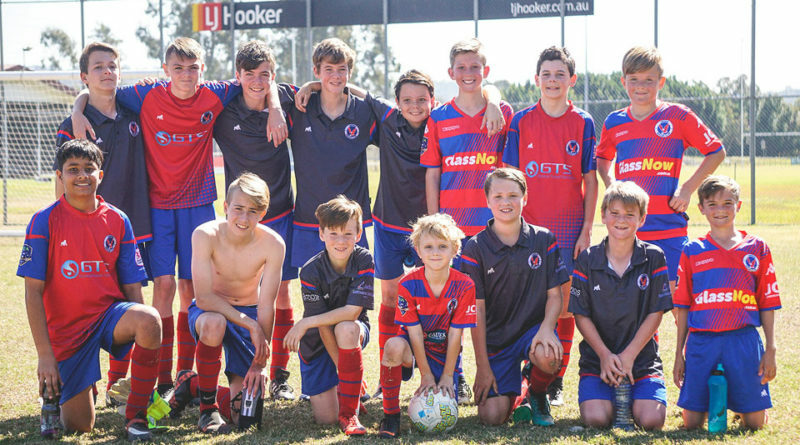 The 2018 Nerang Under 13 teams may have a little bit more than luck on their side though when it’s considered that the club’s emerging teenagers have, this season, enjoyed mentorship and coaching from four legendary coaches with well over 100 years combined of football playing and teaching experience between them. Coaches Gary Stone (Div 1) and Luke Sorensen (Div 3) are cornerstone Nerang Eagles identities, having both played their junior years with the club during the 1970s and 1980s, going on to play in the Brisbane leagues during the 1990s against some of Queensland’s toughest teams and Brisbane Premier League clubs. Both coaches also share one other rare trait at Nerang, being that they also proudly represent families with three generations of Nerang Eagles players in them. 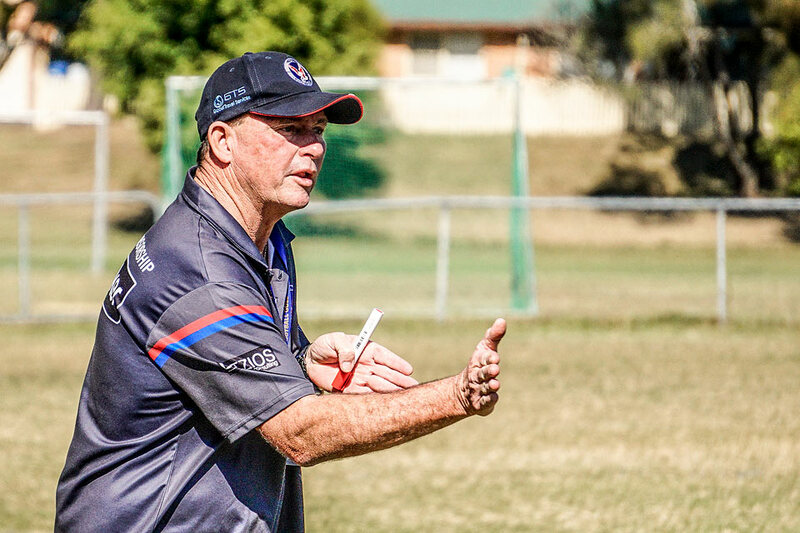 Gary Stone (pictured) and his brother Fred bring a wealth of Eagles’ experience to their roles as coaches and clubmen for Nerang Soccer Club. Both are icons of local football in South East Queensland and part of multi-generational soccer families. Gary Stone’s father, the late Fred Stone Senior, co-founded the club in 1972 and first took to a football field under the Nerang banner. Gary’s daughter Gemma is an up-and-coming player and referee at the club whilst his son Tom now plays in the Div1 Under 13s, keeping the family name firmly in the mix as he blazes across the Glennon Park fields. As a player, Gary Stone’s reputation as a fierce and high-impact defensive player became the stuff of legend as he clocked up hundreds of games for the Eagles throughout his years, both here on the Gold Coast and more memorably, away in Brisbane against the toughest sides in the region. Luke Sorensen’s father, Ebbe Sorensen, is a Gold Coast football legend who co-captained and coached the inaugural Gold Coast United team in 1966 when the club entered the Brisbane leagues for the first time to blitz the lower divisions and rise quickly – long remembered as an extremely formidable team of cracking goal scorers and game finishers. Ebbe left the United team in 1968 and arrived at the Nerang Eagles in 1980 where he took up the game again as a player, coach and clubman whilst his three sons began playing. 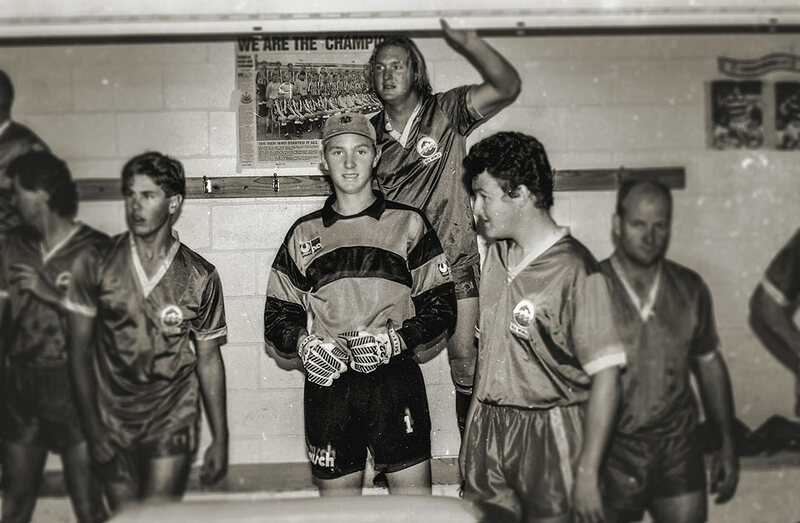 Luke Sorensen (centre) was a formidable and talented goalkeeper as a junior for Nerang Eagles in the 1980s, carrying on into a brief run of senior football in the early 1990s, including one season in the Brisbane Premier League, starting for Nerang’s U19s side. 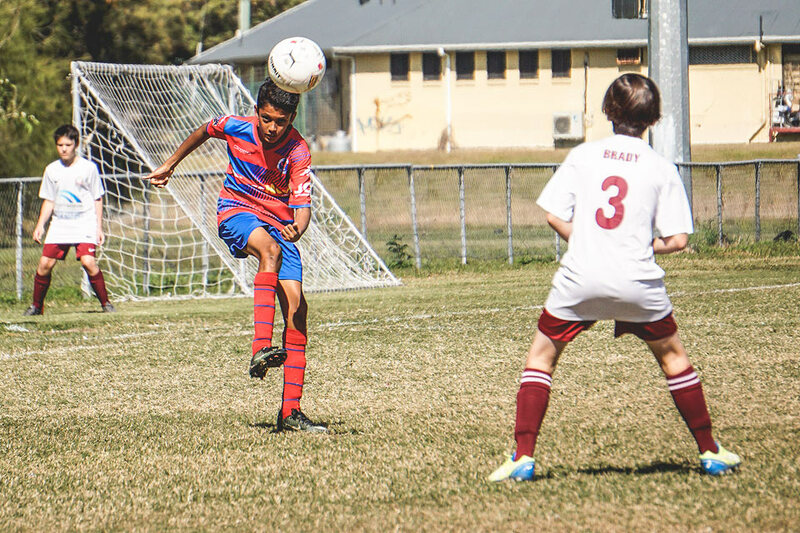 Luke’s sons Lincoln (U13s) and Kyal (U7s) now proudly wear the red shirt for Nerang and are quickly following in their grandfather’s footsteps as goal scorers renowned for precision and finishing moves. 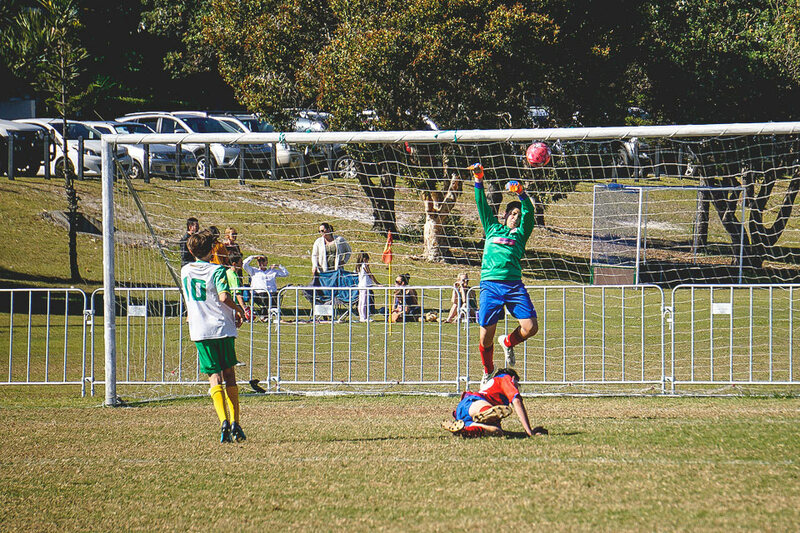 As a player during the 1980s and 1990s, Luke was a formidable and talented goalkeeper who always drew a vocal response from spectators with his defensive prowess and spectacular saves during his final years playing for Nerang. 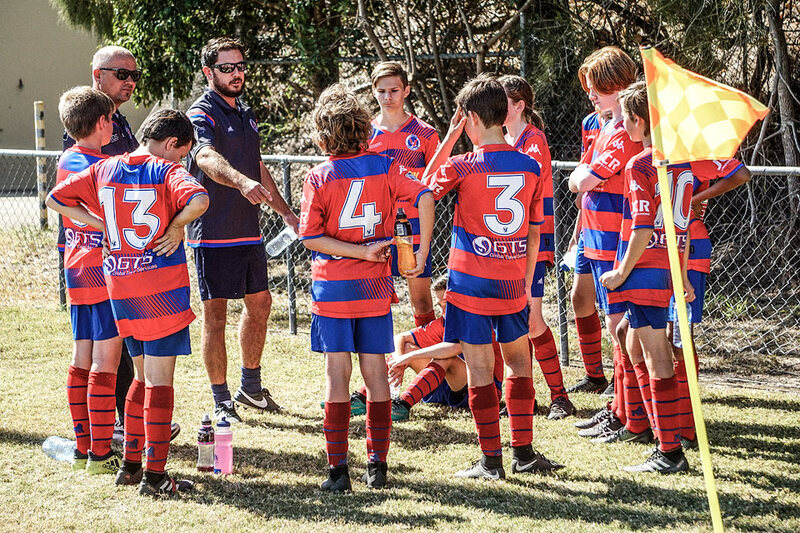 Adding to this mix of Eagles history and experience is Darrell Olive who brings undoubtedly the biggest wealth of time and experience into the U13s mix for Nerang, in his role as coach of the U13 JPL side. Darrell Olive first began his football journey as a junior player for Carringbah Rangers (Sydney) in 1962. Throughout the years Darrel has experienced every aspect and level of local soccer in Australia, eventually coming to the Gold Coast in 1978 for a brief stint playing with Gold Coast United and a notable period at Twin Towns. Darrel’s playing experience leads his coaching style, where the adage that you train just as hard as you play is fundamental to his coaching mantra. 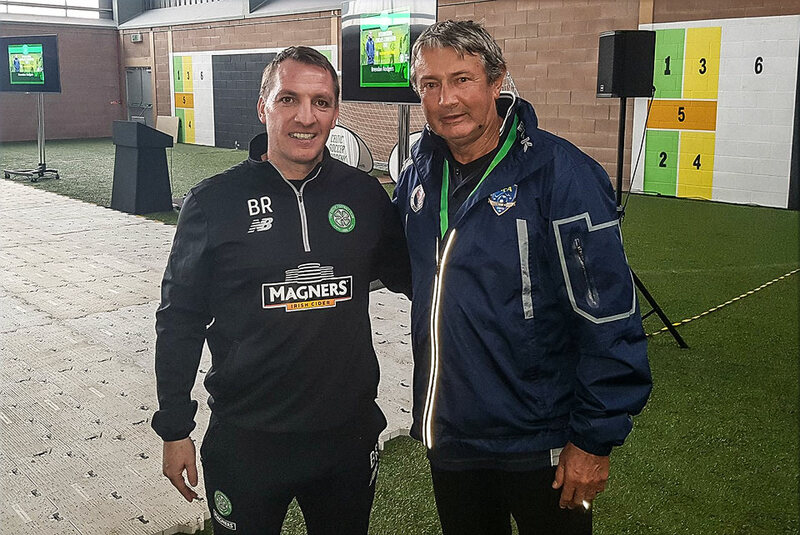 Former Liverpool FC coach and now Celtic FC coach Brendan Rodgers (left) with Nerang Soccer Club’s Darrel Olive. The pair represent the bookend components of what pure coaching commitment, success and experience truly is, from the highest club level in the world all the way down to grassroots local football at its best. Tough and driven, the addition of Olive in 2015 to the coaching staff at both the Nerang Eagles and the club’s training academy, The Academy of Football Australia, has broadened both the depth of experience and the coaching momentum at the club. There’s little doubt that Darrell possesses an unequalled passion and motivation for football success in every aspect of his role at the club. Rounding out the quartet of coaches this year has been Trajce (Traj) Dimovski, a relative newcomer to the Eagles as a coach but himself coming from a fierce and proud football background. 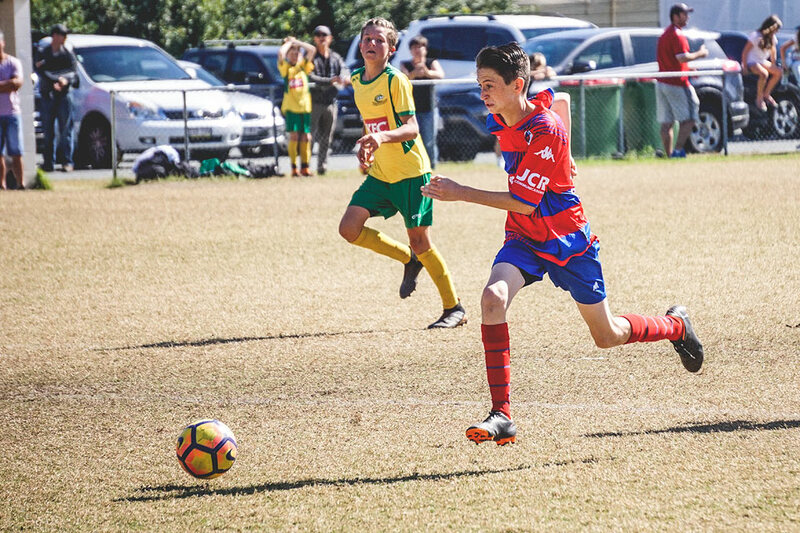 Traj’s competitive drive is infamous as he couples high expectation from his players with a rich tapestry of loyalty, commitment and effort in his U13 Div2 team’s endeavour to make the finals this year. 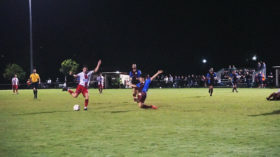 Traj Dimovski (standing) has already made his mark as a coach at the Eagle’s, establishing himself as a high-intensity and driven coach for which successful results on the park are already starting to show as his Div2 team sits in contention for a top-four finish and finals football in 2018. 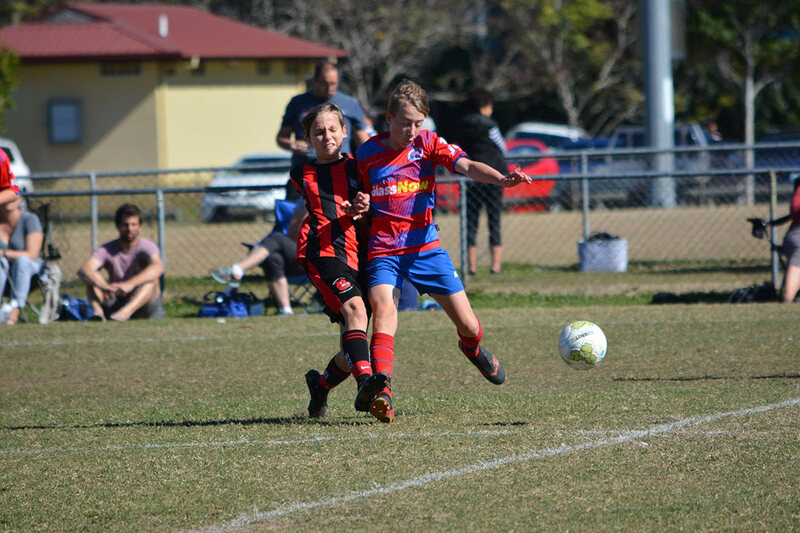 Traj’s son Nathaniel also hits the pitch for the Nerang’s U13s and is proving to be a valuable and fast-paced player for the Eagles. 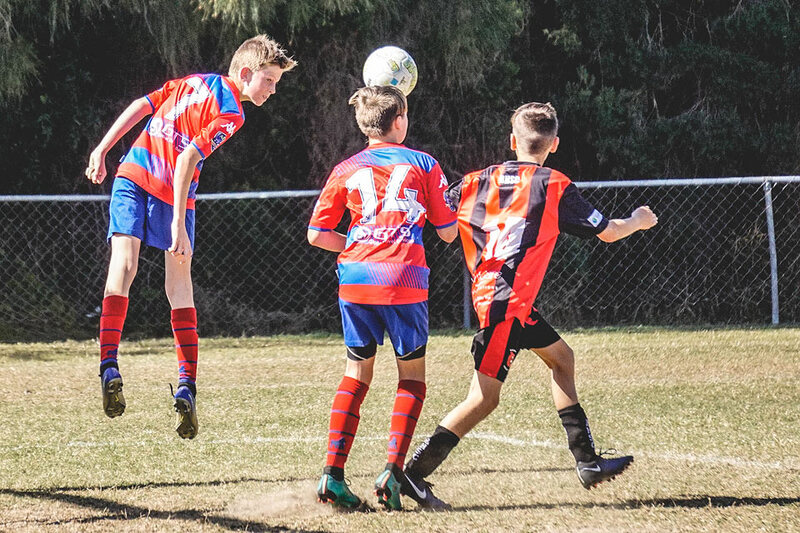 The mix of coaches heading up the club’s U13 teams in 2018 is nothing short of extraordinary for Nerang, and for the kids that play under them, with all four coaches instilling their incredible diversity in style, experience and overall footballing talent into our developing and emerging U13 Eagles. Last Saturday, Nerang’s Division 1 team – under the expert guidance of veteran Nerang Eagles stalwart Gary Stone – reached an incredible milestone with their 40th consecutive game undefeated. In doing so, the team and coach also wrapped up the 2018 Football Gold Coast Premiership. 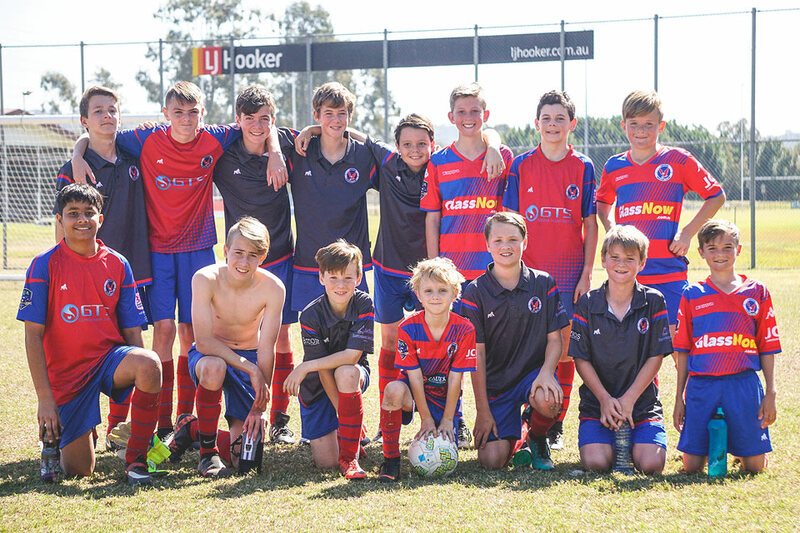 The Nerang Eagles U13 Division 1 team – mentored by Gary Stone – together as they celebrate a massive 40 games in a row undefeated and the securing of the 2018 Football Gold Coast Premiership title in their competition. Already premiers for 2018, the Div1 side is now chasing back to back grand final wins. With a team that has largely remained with the same players over those three years, Gary agrees that the bond between those players has had an immense positive effect on their ability to succeed. “It’s a big difference – it’s massive. To keep the same team together where they all know where each other plays, and they all know where each other run to and what they do with the ball, it makes a big difference. 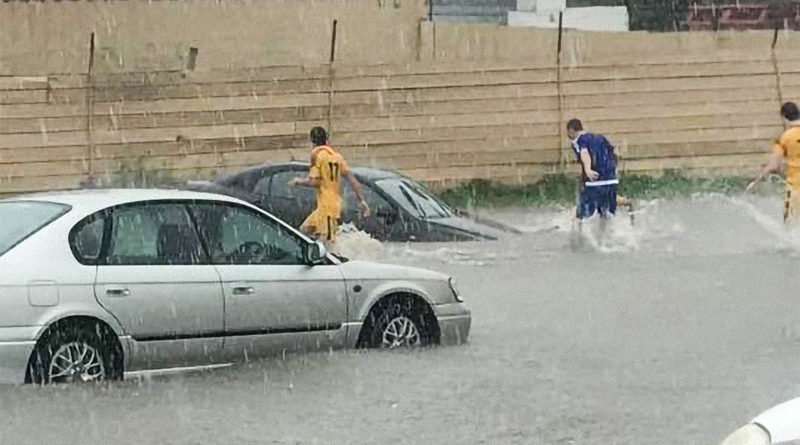 To these boys’ credit, they turn up. If you’re going to go up a year, you’ve got to earn it – you still have to get graded, you still have to earn that spot, it’s not guaranteed,” says Stone, who also holds down the role of Vice President in 2018 for the Eagles. Confident in three dimensions, the Div1 team has plenty of petrol in the tank yet. As they head into the finals and chase back to back grand final wins, Gary says he’s ready to see what his boys can accomplish with several strong teams already nipping at their heels. “I think we are (ready), mentally the boys are there for it – they will be ready. We’re going to go forward and if they play the way they’re supposed to play they should go through quite easily,” Gary adds. Perhaps one of the most diverse teams in the entire club, the U13s Div3 team this year has proven what can be achieved with a positive attitude and a little bit of commitment as they’ve lifted to also be one of the most improved teams across the Eagles’ entire junior spectrum for 2018. A mixed bag of predominantly first and second year players, the team is built from a wide spectrum of playing abilities, personalities, physical attributes and backgrounds, something that has pushed coach Luke Sorensen into unfamiliar territory in order to find a working rhythm and functional tempo for team success. “Of course every coach wants to work with superstars and talent, at least that’s what I see a lot these days – it’s the easiest and sometimes lazy pathway to relative success, and I emphasise that word, relative. I think if you want to find out what sort of coach you are, seek out some of the harder challenges. In my view the real challenge and the real test of any coach’s mettle is in how they pull a team together, a team that perhaps at first and on the surface doesn’t appear to tick all the boxes, a team that hasn’t been moulded or shaped yet,” says Luke of his Div3 boys’ wild journey that began earlier this year. 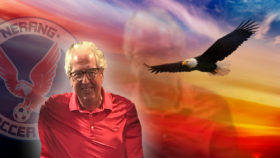 Luke’s Eagles have this year defied expectations both on and off the field, developing into a tight dynamic that has rattled some of their division’s top teams despite some unlucky results along the way. “What I’ve seen this year from these boys has been quite remarkable, and what we’ve all achieved has been pretty extraordinary. 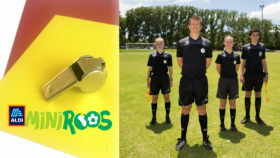 There’s no doubt that a team full of those superstars can be a formidable force on a football pitch however we’ve really gone in the opposite direction, shaping and developing roles and responsibilities for every player so they can play to their strengths, play to their potential and ultimately play as a working cog in a machine. Not to say we don’t have our superstar moments here and there. This year the machine has been our team and we’ve assembled all of our parts now in such a way that it’s starting to fire,” he says. Just last week the Div3 boys steamrolled their Tweed Heads opposition with a 5 nil drumming at home under lights. The Tweed side was sitting 5 places above the Eagles on the ladder but it didn’t deter the boys – many of them relatively new to football – from putting on a clinic for the home crowd. “Yeah that game was just an example of the boys now starting to really grasp how a good team functions and how our shape and form, especially in defence, can cause opponents a lot of grief. To their credit, I’ve got a fantastic team of good young players who are quite focussed, eager and most of all very united now in such a strong way on the field, and it shows. Our strongest players down to our newest players all put in 110% for every game and with that they’ve actually shown themselves – through their own hard work – that their potential is much higher than they probably expected,” he says. Every cog in it’s place, the Div3 team is starting to fire on all cylinders. The club’s Div2 U13 team has put on a strong performance this year, currently skirting the edge of a potential finals berth. Under the motivated guidance of coach Traj Dimovski they’ve conquered many hurdles along the way to present as a challenge to any team that faces them. Traj says his team has also come a long way from the start of the year and he’s sure they’ll be finishing strong for the 2018 season. “I’m confident in the boys, coming from the start of they year I personally think there’s been a major improvement in their development, both game wise and in everything else they do,” he says. Listen up! The Div2 team can taste a spot in the finals, and the next couple of games will seal their fate one way or another for 2018. Much like the Div3 team, the Div2 team has a rich mix of varying abilities and characters, which is a challenge for any coach to meld together into a working and successful team. Coach Traj says it’s been a long road for his team but one they’ve slowly and constantly worked away on. In a tough division, the Div2 team has had to lift to achieve the results they’ve already had this year. The boys are looking strong and have every reason to be proud of their performance so far. 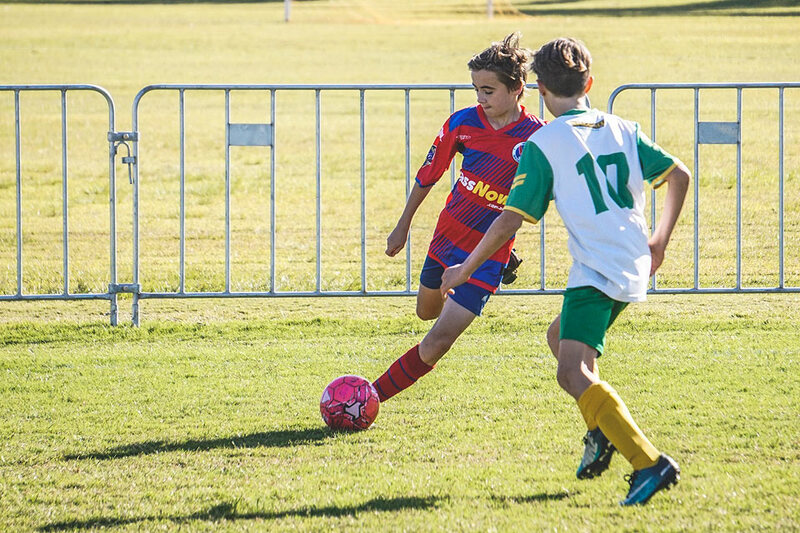 Like a lot of our U13 teams, there’s been some nail-biting moments this year where young players have struggled to capitalise on game dominance – struggled to hit the back of the net despite controlling the game – and it’s something that every coach has to deal with along with their players. Traj agrees that it’s a tough age for the players where they are starting to grow out from junior football and explore the pressures of a more mature playing experience on the field each weekend. The Div2 Eagles have made their opponents have to work for every single minute of every game this year. “I think when it comes to game day the boys do start getting a little bit nervous. When it comes to training they almost never miss the goal, it’s like they’re going to rip the net, but unfortunately when it comes to game day we sometimes can’t seem to hit the target. I don’t know if it’s pressure or … in a few games we’ve really shown that it can be done and we’ve done it very well, scoring 5 plus goals and that, but today (1 nil loss to competition leaders Coomera), unfortunately we couldn’t find the net,” says Traj, reflecting on an opportunity lost in the last minute of the game. Traj’s team of hopeful young players now have to win their remaining two games if they are to chance a top four finish and spot in the finals, something that is definitely within their reach and within their capabilities. Rounding out the club’s eclectic and strong array of U13 teams is our U13 JPL side, mentored by veteran coach Darrell Olive. The side has had somewhat of a two-speed season with some incredible wins and frustrating losses equally defining their position in the competition. Sitting just outside a top four finish their run to the finals is fast becoming a do-or-die affair. 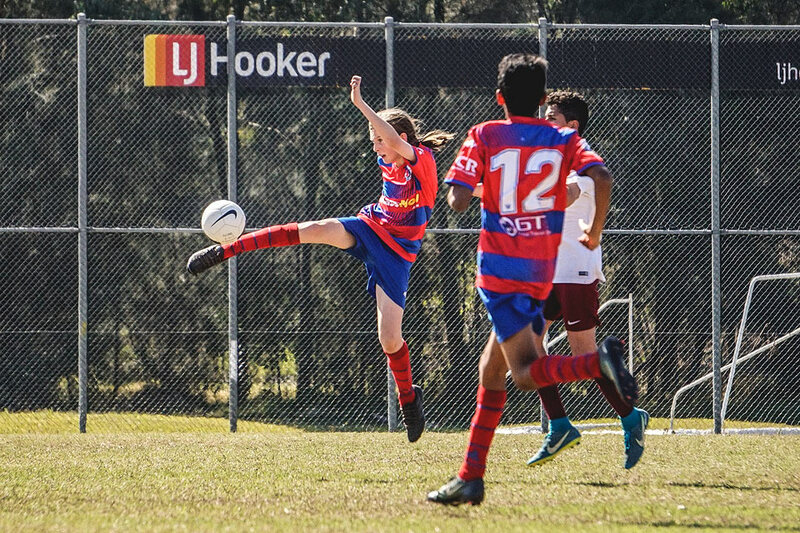 The Nerang U13 JPL side are serious finals contenders if they can take the next couple of games. The emerging JPL side is dynamic and full of readiness on the ball yet in a fiercely talented competition featuring the city’s best young footballers they’ve hit their stride in doses resulting in them, like our Div2 team, sitting on the cusp of a final four placing pending the outcome of their remaining few games. 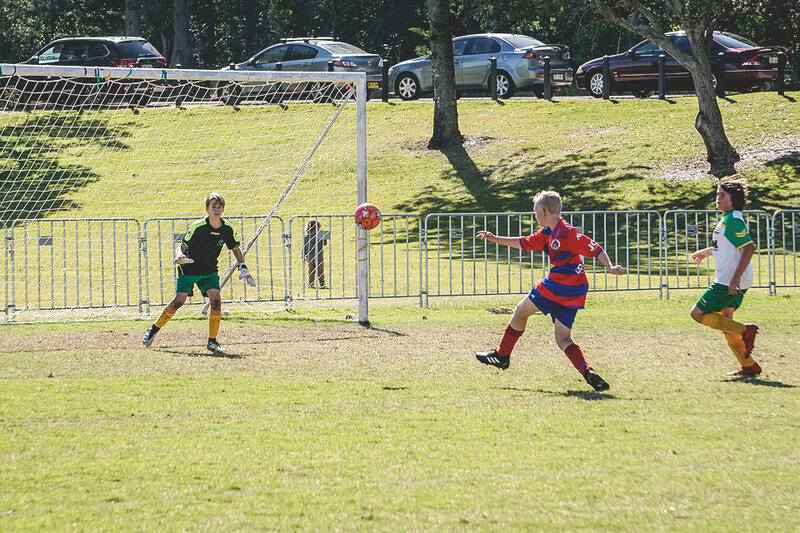 Darrell’s somewhat relentless will to succeed and his dedicated input into the team has created a resilient and capable group of boys who are without any doubt up to the challenge, being constantly pushed to improve and excel on the field as Nerang Eagles and representatives of the Academy of Football Australia. It’s simply a matter of time and a matter of will to succeed that should see this team continue to rise to the challenge no matter how intimidating or difficult. We can only see a bright future for not only this team but youth football at Nerang as these players become the new standard moving forward. 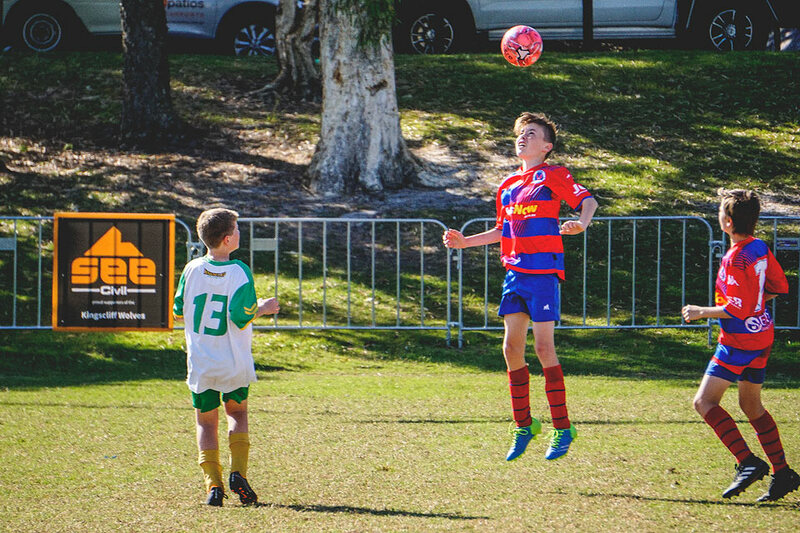 From the top down, the Eagles club have created football opportunity and an experience for an incredibly diverse array of skill levels, interests, personalities and backgrounds, resulting in the club fielding four Under 13 teams in Gold Coast’s Junior Premier League (JPL), Division 1, Division 2 and Division 3 competitions for 2018. All four teams have achieved incredible results this year, with 3 of the 4 teams chasing down top-four finishes and our Division 3 team lifting to become one of the more memorable Nerang sides in recent memory with their noticeable improvement, zest for the game and great camaraderie on display. It’s undoubtedly a strong beacon and indicator that the future of the club’s competition juniors is a bright one filled with optimism and excitement. Fergus showcases his hard-practiced ambidexterity on the ball for the Div1 side. 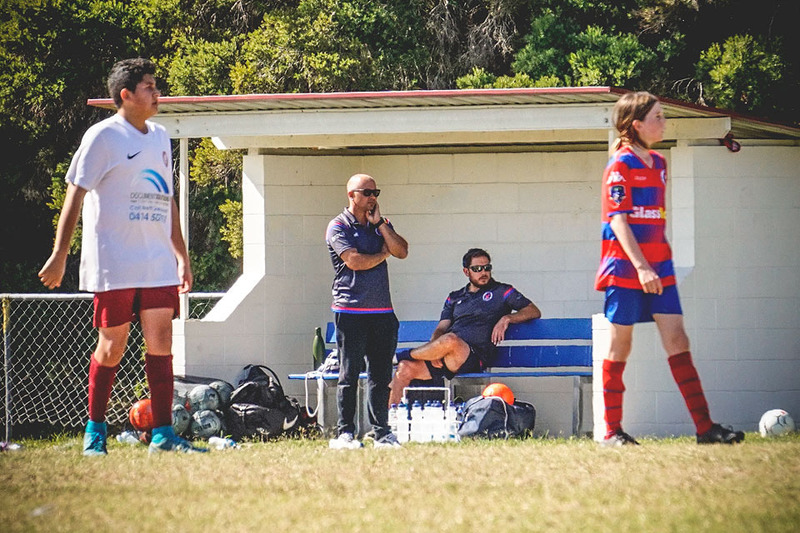 Opie, himself a coach and former Nerang junior from the 1980s, says that having a place for all levels of players is a vital part of grassroots football and local club development. “The depth we have within all of our teams now makes it very easy for Nerang. Moving forward, a lot of clubs lose a lot of players at this age but we’ve actually been gaining more players, all coming in this year looking for that opportunity,” he says. 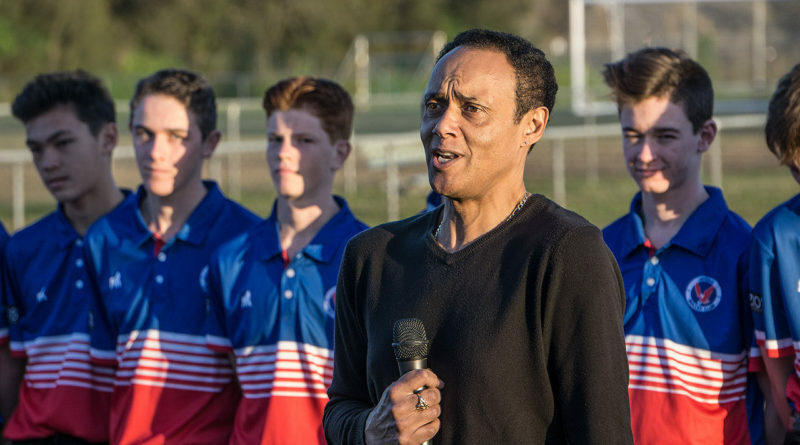 Michael adds that it’s not just the football experience, but the social fabric of club football that attracts young players and offers them a tangible benefit for playing the game. Connor is fast becoming a dominent player with pace out wide for his Div3 team. “The friendships and social component, it’s crucial. The kids will sit around and hang out afterwards, they know they’ve got good mates they’re going to see every Tuesday, Thursday and Saturady and build relationships outside their normal peer environments. You know not all these kids go to the same school so it’s things like this that help build their social skills in new circles and around other people and environments, it’s fantastic,” he says. Coach Luke Sorensen says he’s seen an even greater personal development aspect in his players this year, seperate to their football performance and results. “I’ve really tried to instil some well-defined core values and structure into my U13s this year, as I do with every team. 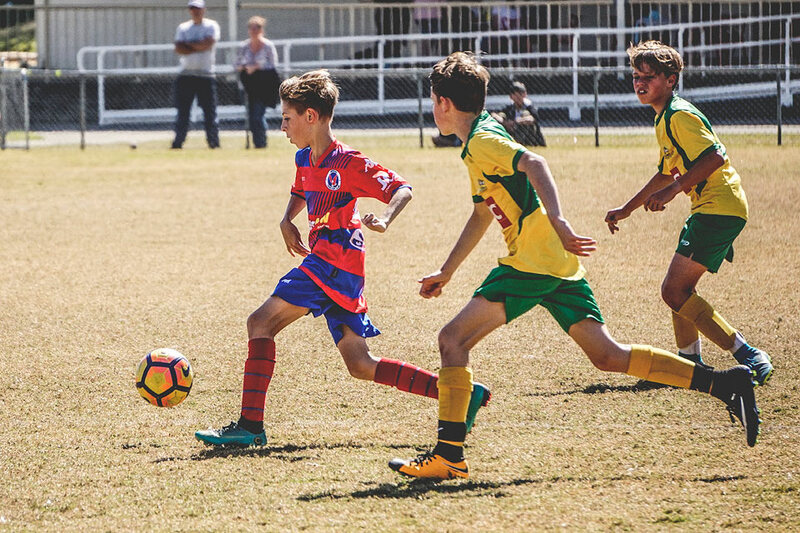 Our team is an environment where some of the social pressures kids face these days like prejudice, indifference, racism, bullying, or any of those difficult issues, are absolutely excluded when these kids step onto the park at Nerang Soccer Club,” says Luke. “Whilst kids at this age will inherently be competitive and abrasive at times, even emotional or rebellious, when it comes to the social values and camaraderie in this team, these guys have all got each others back. You can see it on the field, they all work as one without any question and they support each other almost unconditionally – confidently – which is what football should be about. It makes the task of playing in a team challenging but overall it makes it rewarding and fun and gives the kids something special that a lot of their mates at school don’t have,” says the former goalkeeper now Eagles coach. Gary Stone agrees and sees something special at the club with the four U13 teams this year, something bigger than the football itself. “The interest we have from all of these boys, with all our teams from the top level down to bottom level … and that bottom level team (Div3) puts in so much effort each week, and that’s what makes me happy. 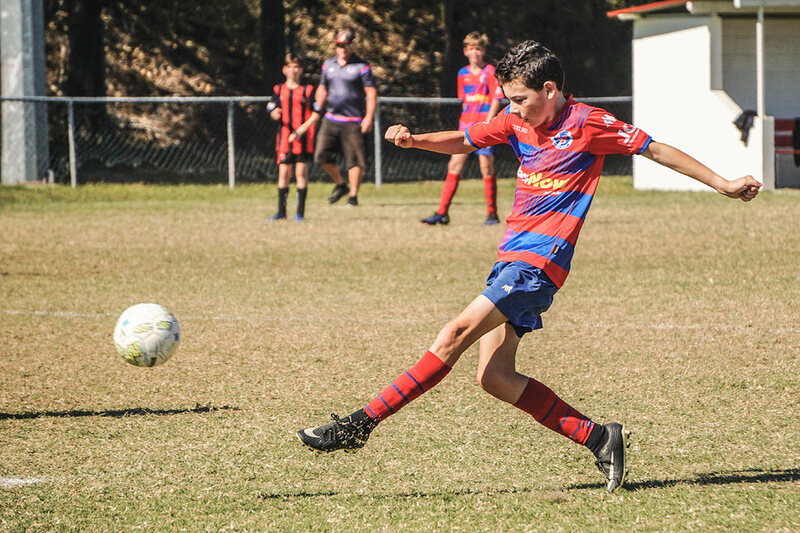 When I see those boys playing, the Div2s working just as hard, right up to the JPLs, it’s not just individual teams, they all get together and talk to each other, they all know each other … and we’re a family club and the U13 boys have that friendship and family happing here with the Eagles,” says Gary. 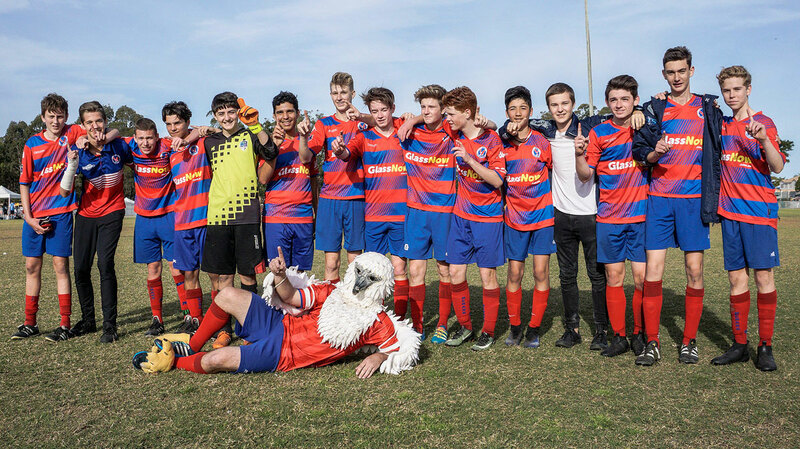 The Nerang Eagles U16 JPL team set the standard for football excellence and achievement in 2017, dominating their competition to become the top U16 side on the Gold Coast and winning both the Premiership and Grand Final. Their success story has already opened up some serious pathways of football opportunity for the players. Friendship, camaraderie and a disciplined unity were key factors in their achievement. It’s little wonder that players across the coast are keen to join the Eagles! 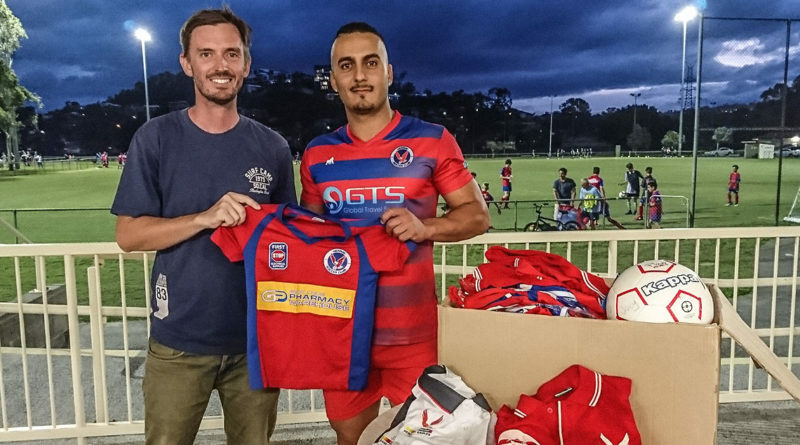 As for the growing youth interest in the club, Gary says that the word travels quick around town that there’s something special here for young players at Nerang. “These kids want to play under our structure, they can see what our Academy does and they want to join that and be part of it. The parents want their kids to develop and play good football but also get that little bit more, and be part of the structure and family at Nerang. If we keep that kind of system going forward, we’ll have more and more kids coming, but our spots are becoming very limited too so to get in, you’ve got to get in early for 2019,” Gary finishes with. Speaking of spaces, the home grounds at Nerang are bulging at the seams with player numbers, and 2018 has seen the impact of the club’s growth take its toll on our facilities. Grass, training space, parking, storage, our kitchen and bar spaces are all now under immense pressure to keep up. Let’s hope that 2019 brings some relief and support by way of more sponsor and partner interest along with the ongoing and improved support from our local and state government and representatives. High on the list are more field space up the back of the grounds and lighting on that space to expand training options, along with fence repairs and moving the bar to the front window of the clubhouse for easier access.